This is an easy project for one kid at home or for a whole class of kids to create a Cardboard Tube Heart Garland for decorating the classroom. If you don’t have a supply of cardboard tubes to create this Heart Garland, have the kids bring them from home or have friends and neighbors save them for you. Recycled cardboard tubes make a great craft material. 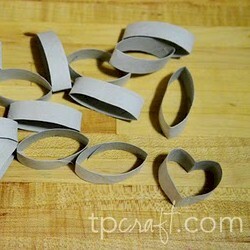 Cut your cardboard tubes into 1/2 inch pieces and form into heart shapes. See picture below for reference. Paint your cardboard tubes and allow to dry. Cut your straw pieces into 1 inch pieces. String your hearts together and find a nice place to hang them.